Lyric Opera Chorus, Orchestra of Lyric Opera of Chicago / Alejo Pérez. Stage director – Robert Carsen. Lyric Opera of Chicago, Civic Opera House, Chicago, Illinois, USA. Tuesday, March 14th, 2017. 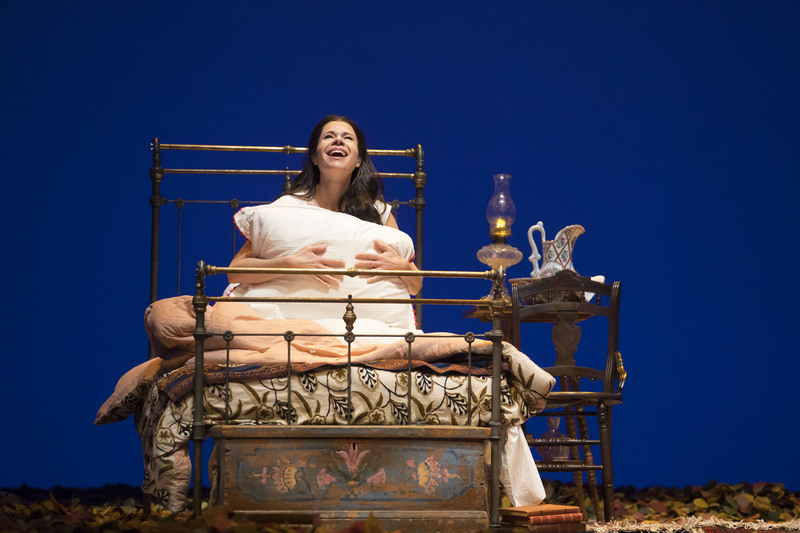 This was my second visit of the 2016 – 17 season to Chicago’s Lyric Opera and on paper this was a most alluring prospect, with three exceptional singing-actors on stage together to perform Tchaikovsky’s lyric scenes. What struck me about Lyric’s audience tonight was the welcome diversity of ages. Clearly, opera has a very bright future in this culture-loving city. 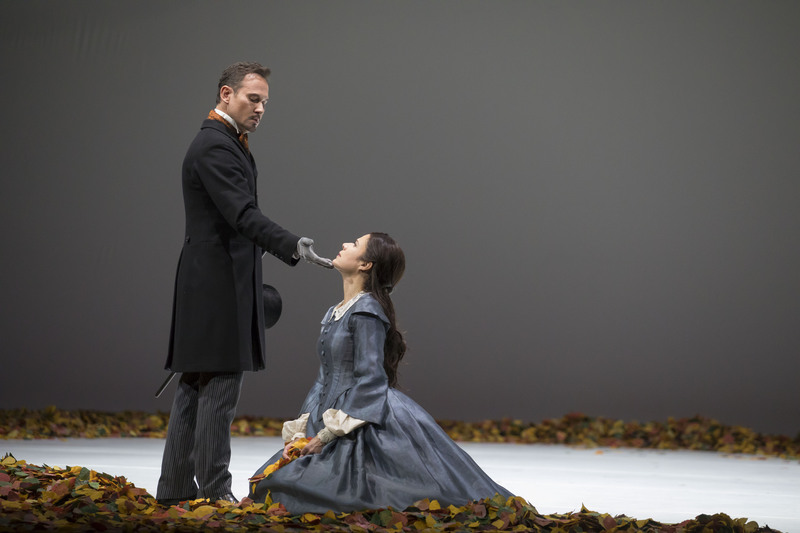 The staging for this Yevgeny Onegin was the work of Robert Carsen. 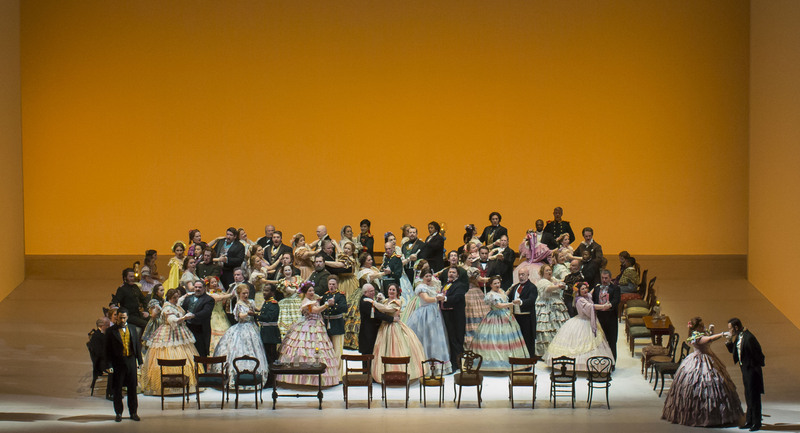 Originally produced for the New York Met, it is currently owned by Toronto’s Canadian Opera Company. The overwhelming sense that one leaves with was the sparseness of the visuals. Very often, the props were just a desk or a bed or some chairs, within a simple box which was at times atmospherically lit. Consequently, this placed a lot of emphasis on the principals to carry the story effectively. 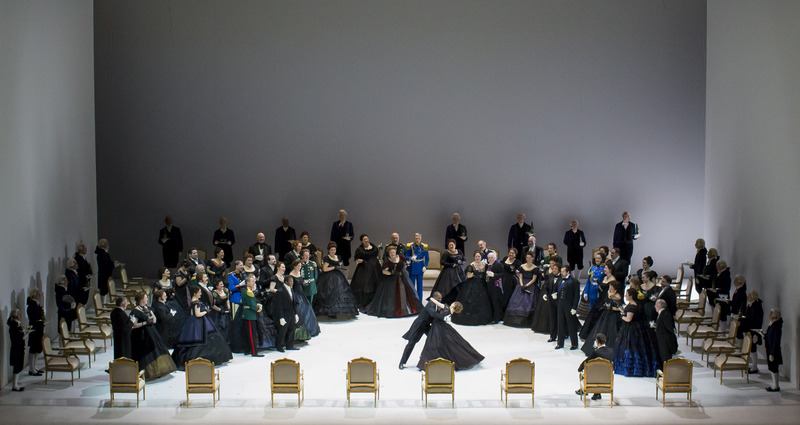 Indeed, the great open voids of the set reminded me of Carsen’s recent Royal Opera Rosenkavalier but, in contrast with that show, I found here that we did have genuine chemistry between the principals. 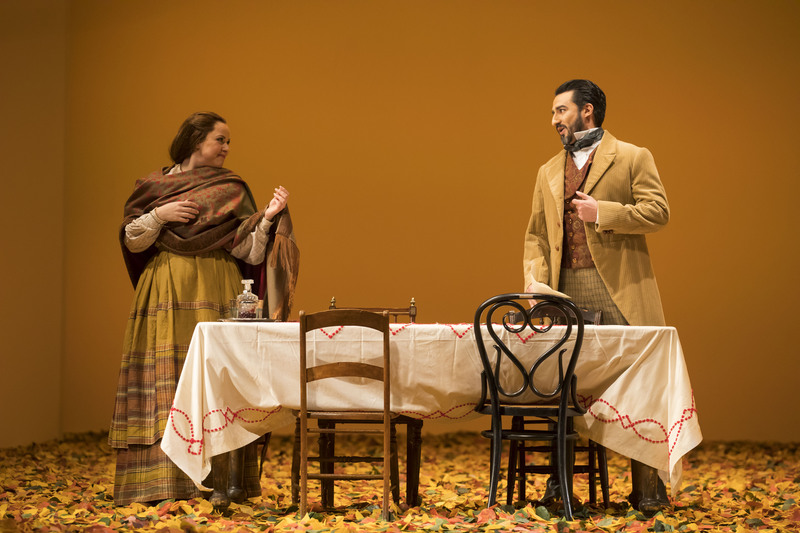 Certainly, in Mariusz Kwiecień’s Onegin, Ana María Martínez’ Tatyana and Charles Castronovo’s Lensky, we had singing-actors who were able to create fully-rounded characters within this minimalist environment. Furthermore, we had characters of astounding complexity – in all three cases we saw their characters embark on a journey and draw us, as audience members, into their world. Immediately after Onegin rejected Tatyana, the lights came up for intermission and reminded me that I was in fact in the theatre, such was the immediacy of the two performances that I forgot that I was watching two individuals portraying fictional characters, but instead, felt that I was living Tatyana’s despair with her. I found there was one issue with the staging and that was the use of leaves in the opening few scenes to carpet the stage. I had a sense that it may well have affected the acoustic properties of the set, swallowing some of the voices that were placed further back on the stage. This isn’t the first time I’ve experienced this with Carsen – there was a similar issue in the use of dirt on stage in his Paris Elektra. It certainly looked attractive but I’m not convinced it was in the best interests of the cast. 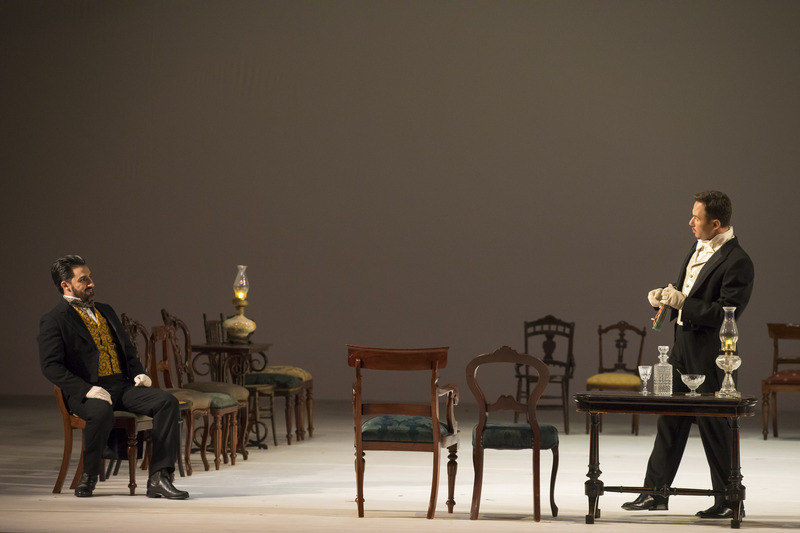 Undoubtedly, the link that Carsen makes between Onegin being seen on stage alone as the curtain goes up, ripping up a letter that then leads to the leaves falling is most striking, perhaps indicating the coldness of Onegin’s personality – the emptiness of the set suggesting the emptiness of his soul. Above all, these are three individuals who, despite being surrounded by people, are extremely lonely. Before the duel, Lensky is seen alone, writing a poem; at the start of the final scene, so is Tatyana, reading a letter. There is something there about being alone and not being able to express oneself except through the written word. This was my first introduction to Argentine conductor Alejo Pérez. He has a flourishing career and has already appeared at some very prestigious addresses. There was much to admire in his conducting including judicious use of rubato and the dances were nicely springy. And yet the tempi that he chose for the earlier part of the opera felt far too slow. This is music that should surge with youthful vigour, but here it was lacking in energy and passion despite the excellent performances given by the principals. There were times at which this approach worked – in Lensky’s big aria, Castronovo was given the space to work magic, which he most certainly did. The winds played well for Pérez but intonation in the strings was often patchy. It almost goes without saying that Kwiecień’s acting ability is not in doubt, but what was notable tonight was how different and how psychologically sophisticated his Onegin was from previous incarnations of the role that I have seen him in. The haughty, aloof character, obsessed with a drink, that he created was clearly someone who did not understand himself and was definitely not capable of understanding others. What Kwiecień gave us – as so often the case with him – was a masterclass in connecting voice, text and physicality. The way that he shaded the tone in the duel scene, almost white with fear was masterful. His velvety baritone developed a knife-like steel as he rejected Tatyana and the desperate hollowness that he found in the final scene was haunting. Kwiecień is a singer who never takes anything for granted and tonight took us on the journey with him. Tatyana is a new role for Martínez for this run and she is already a very fine one. She sang the role on the text and her ripe strawberries and cream soprano gave much pleasure. Hers was a very physical Tatyana, communicating so much through her body as much as with the voice. The optimistic yet broken schoolgirl contrasted strikingly with the steely, regal princess again finding a steely edge in the voice for her confrontation with Onegin, soaring magnificently in those big arching phrases. Castronovo’s Lensky is something very special indeed. 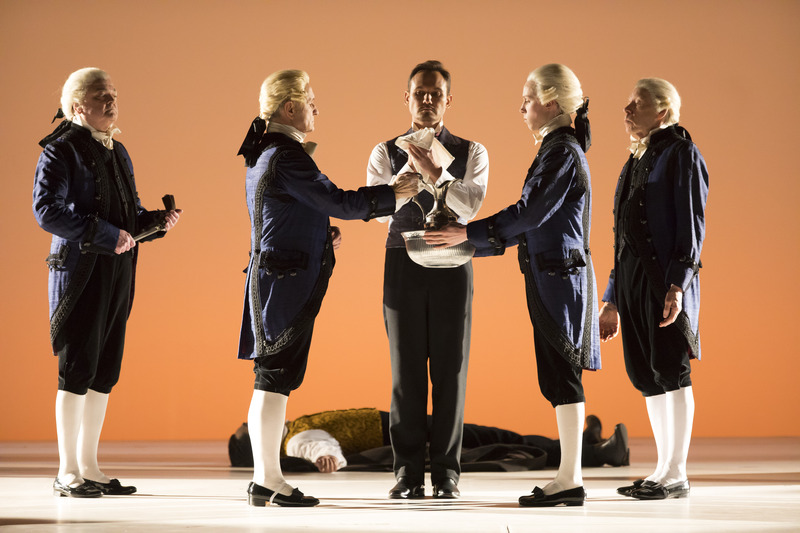 In fact, I would go so far as to say that his is the finest Lensky I have seen on stage – and this is a role I have been very lucky with in the theatre. He perfectly encapsulated the dreamy poet, his yearning ‘ya lyublyu tebya’ to Olga dreamily seductive. In his ‘kuda, kuda?’ he gave us five minutes of pure emotion – drawing us into his world as he faced death, it was unbearably moving. 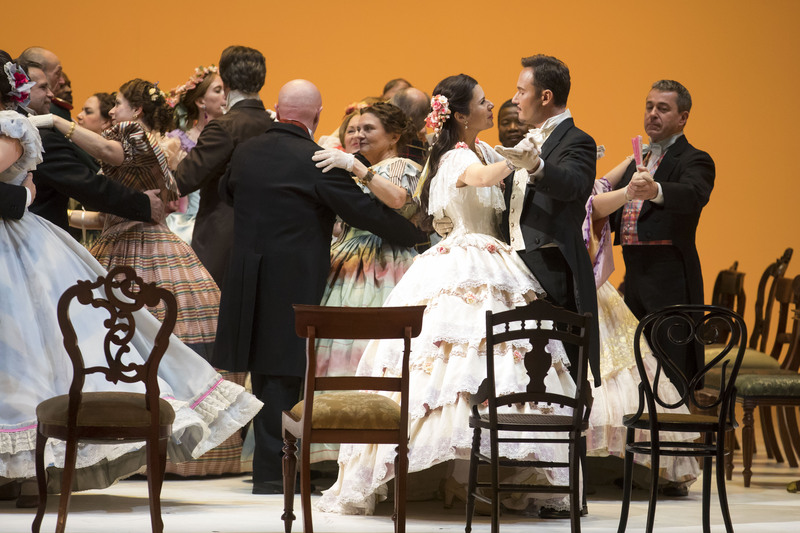 What distinguishes Castronovo is the sheer security of his vocalism; one was never in doubt that the voice would fail to do what its owner asked of it and his handsome Italianate warmth gave such enormous pleasure. He also caressed the language in a wonderful way – he had clearly worked hard on it and, certainly to my ears at least, sounded like a native speaker. Castronovo is such an intelligent singer and tonight really did give us something very special indeed. The remainder of the cast was very decent and reflected the high standards of the house. Alisa Kolosova sang Olga in a silky mezzo with a nice full lower extension. Her native diction also gave much pleasure. Dmitry Belosselskiy’s Gremin was sung in a broad, cavernous bass although lacking in a little resonance at the bottom. Jill Grove’s Filippyevna was unashamedly chesty and Katharine Goeldner’s Larina was sung in an aristocratic mezzo. The chorus gave quite a good account of themselves with vibrant, full-bodied tone. Tonight’s Onegin was very much about the work of three exceptional singer-actors who gave us psychologically sophisticated and vocally extremely satisfying portrayals. Indeed, the privilege of seeing singers produce such all-consuming assumptions of their roles is something quite extraordinary. If ultimately tonight didn’t quite move me as much it might have, I think that was ultimately due to the over-weighty conducting, that did have merits in places, but was overly ponderous too often. Still, this was a remarkable evening in the theatre and one I am glad to have had the privilege of seeing.